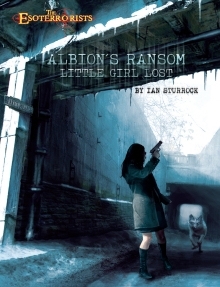 This massive first part of the two-part Albion’s Ransom adventure clocks in at 105 pages, 101 pages of content if you take away editorial, ToC, etc. This review is mostly based on the softcover print version; the pdf version does not sport bookmarks, which makes navigation annoying. So, this adventure is set in the UK, and as such, it comes with a well-written and interesting appendix that notes the use of abilities in conjunction with the local regions and explains peculiarities of UK English, as well as giving a cursory overview of the different regions of England. A whole page of slang-terms and an explanation of pub culture can also be found here. From there, we move on to explain regional rivalries, how religion is treated, notes on travelers, crime, eco-activism…and, obviously, esoterrorism activity. Beyond that, we receive notes on Manchester, including gang activities, etc. – in short, we get a surprisingly detailed gazetteer here. The section btw. takes cultural differences between UK and US into account and explains them in a concise manner – so if you haven’t actually studied/visited the UK, chances are that you’ll get something out of this. Really nice! It should also be noted that the adventure features a pretty extensive 2-page summary of drugs and their use in Esoterrorists, providing a wide array of effects that once more can be considered to be impressive in its details. This attention to detail is btw. also a component that extends to the adventure-proper, but in order to talk about this aspect of the adventure, I will have to dive into SPOILER-territory. Potential players should jump to the conclusion. All right, only GMs around? The 18-year old student at Manchester University Catriona Van Rijn has gone missing. Her father, Frank, is a truly valuable asset for the OV and thus, the PCs are sent in to find the girl – note for Americans: No big guns, this is the UK we’re talking about. The PCs are briefed twice and hopefully are aware that time is of the essence: While it is not explicitly spelled out, the PCs are very much on the clock and should meticulously plan where to go when, how to spend their time, etc. That being said, investigating Catriona’s flat, her room-mates and associates is perhaps one of the best-written investigations I have ever read. Not only are the diverse students depicted as well-rounded characters; they manage to feel alive. You see, Catriona is not just really smart, she also goes through developments that are similar to those many folks go through when studying: She not only has obviously grown into a sexually active lady and is experimenting with what you’d expect, while also developing an idealistic, moral compass that is grounded in eco-activism. This tendency is supported further by a blossoming interest in the occult, something that should generate some serious red flags for the OV-agents. It is hard to describe just how good and detailed the characterizations here are – from flatmates to associates, the students feel alive and interesting…oh, and there’ll be perhaps one of the most skillfully executed red herrings ever in this investigation: When a flat explodes, the PCs may assume esoterrorist influence – but ultimately, what happened had nothing to do with the dark forces behind Catriona’s disappearance, and everything with an unhealthy drug-habit and experimentation with ether. The Order of Bards, Ovates and Druids, OTOM…and more – beyond the students and their quirks, the PCs have to reconstruct the complex dynamics of Catriona’s life, which, among other things, is complicated by her having spent the night with her lecturer. Let me make that abundantly clear: Once more, the characterization of the eco-goth-intellectual is hilarious. In the interest for Blake and the occult, this character felt, in a great way, like an evil caricature of myself. (Just for the record: Nope, never slept with one of my students, don’t plan on doing so.) In fact, the depiction of the British subcultures in academia and beyond is probably one of the most amazing I have ever seen: In spite of the themes of Esoterrorists, which may be considered to be inherently conservative by design, the depictions of all the NPCs makes them come alive in a manner I have never seen beyond the pages of this book. While esoterrists codes those interested in the occult as potentially evil, the characters herein do not feel like that at all – they are complex, multi-faceted and while some folks may seem despicable or misguided, you can’t help but feel that the depictions of these groups steams from a deep-seated sympathy. But I digress. You know, the big, big issue for the PCs in this investigation is, first and foremost, the vast amount of details and information that can be unearthed. This module is ridiculously detailed in the information provided around all key persons and sports multiple ways to reach the conclusion. We have a truly amazing web of intrigue here – and one that thankfully does not rely on throwing OD-entities at the PCs all the time. Tension is slowly, steadily, ramped up as the timer ticks. This is not full-blown in your face horror, instead following the design-paradigm that less is more, as not only the complexity of the case, but also the detailed reactions and behavior patterns of the NPCs make it hard for the OV-agents to get to the core of things. As an aside: I think that a flow-chart summary would have been really helpful for the GM – as written, you’ll want to take copious notes to properly run this. Ultimately, the trail leads to the 9 ladies, a Neolithic monument scheduled to be quarried, and the protest camp there. Unfortunately for the agents, the camp will be seeded with esoterrorists…and if they don’t take care, they may well end up drugged, potentially added to the planned mass sacrifice…for much is at stake. The esoteric underground cell Isa Kenaz is preparing to unleash the Fimbulwinter upon Britain, and this sacrifice, a perverted Ewemeolc rite (in a hilarious glitch, it’s noted to take place on February 31st – that should be January 31st/February 1st, unless I am sorely mistaken regarding my knowledge of pagan holidays), may well be the trigger that does it. Worse, there is a decent chance that Catriona’s been driven insane and/or converted to being an Esoterrorist…and, you know…every HOUR may actually count – time is incredibly critical and any group that manages to reach her while she’s not yet been brainwashed should pat themselves on the back. The OV-agents will need to infiltrate the camp and find the girl in a mine-shaft, which represents one weakness of the adventure. You see, the finale works imho best when the OV-agents actually get drugged, but don’t succumb to the effects; attempting to stop the ceremony, rescuing Catriona, not being slain by psycho-Esoterrorists, all through the haze of drugs, makes for an absolutely glorious scene. That being said, we don’t get a map of the camp, which makes infiltration and the whole final scene feel rather opaque. The camp is hard to picture and, particularly considering the moving parts in play here, it would have made sense to provide a proper map – this is also the only truly potentially horrific scene herein; the adventure plays very much like a mystery module and builds tension in a smart and amazing manner. As you may notice, there’s a lot to love here. However, here is the thing: If your OV-agents are really good, if they can piece together a couple of the more complex components, they may well stumble over the plot of Isa Kenaz, or at least parts of it. In an ironic twist, this is a bad thing – the timeframe the PCs have to secure Catriona is very, very tight and deviations like that may well cost them the time they need. So, ultimately, while the book does not explicitly state it, the PCs are supposed to “lose” this adventure in some form. While it is *theoretically* possible to utterly “win” the adventure, expose Isa Kenaz and save Catriona, it is extremely unlikely. There is one aspect that literally made me throw the book through the room. It cheats in the most cheap of ways. Know how Isa Kenaz is one step ahead, how the OV-agents face a disturbingly well-prepared opposition? The book breaks a central tenet of Esoterrorist-gaming, one that can result in permanent damage to an ongoing game. Mister Verity is actually an esoterrorist. Urgh. A central tenet of the game, what sets it thematically apart from a vast number of other settings, is that the OV is good; that it is competent, and while it does lose agents to madness etc., the rigorous vetting, examinations, etc. should engender a sense of trust. By making the PC’s contact a traitor, the module breaks a central tenet of the setting that is even explicitly spelled out in the game’s book: The OV is competent and its agents are the good guys. It’s a basic premise of the game, and once it is subverted, there is literally no way to fix it. It’s also needlessly cheap and unfair: PCs are told, time and again, to trust the OV; by undermining this, the module manages to all but ensure the outcome projected for book #2. In short, the adventure cheats. Unless PCs realize just how urgent their search is, unless they focus on doing the right things, fail to report things in; unless they don’t attempt to be meticulous (takes too much time); unless they focus on the right priorities, split up, etc., they will be faced with a big downer of an ending. Difficulty of the investigation is not my issue here – it’s this utterly unnecessary subversion of a central tenet of the game, a needless, unfair kick in the shins of even the most capable of agents, one that frankly almost wrecked this adventure for me. It is hard for me to properly enunciate the level of outrage this decision engendered, mainly because, apart from the somewhat opaque finale, this is one amazing, glorious investigation. This is, and let me make that abundantly clear, a challenging, inspired adventure, one that didn’t need this cheapshot. In another game, perhaps in Faer Itself or Trail of Cthulhu, the betrayal would be less important – but in Esoterrorists it undermines a pillar of what sets it apart. Editing and formatting are good, though not as refined as in most Pelgrane Press offerings. I noticed a couple of typo-level glitches etc. Layout adheres to a really nice two-column b/w-standard and the adventure sports some neat b/w-artworks. The lack of cartography for many locales is a downside from a presentation perspective. The softcover book is solid, sports the title on the spine, etc. The pdf, as mentioned before, lacks bookmarks, which is a HUGE comfort detriment for an adventure of this size and complexity. Ian Sturrock’s prose is absolutely glorious; the author manages to write a fantastic module and his characterizations of the NPCs herein is compassionate, kind and simply superb. The little details, from hidden means of identification in e-mail addresses etc. to the more overt aspects, are absolutely inspiring. The gazetteer helps you add a sense of authenticity to the proceedings and the investigation per se is absolutely wonderful. The module manages to evoke a great form of tension, does not rely on shock horror, and must be considered to be an inspired, intriguing offering. That being said, the module has several serious weaknesses that drag it down from the high recommendation and lavish praise I’d otherwise heap on it. The finale is, as mentioned, somewhat opaque; but more insulting would be the absolutely horrendous cheap-shot regarding the primary antagonist. The fact that this can actually subvert a central tenet of Esoterrorist campaigns makes it problematic. Finally, on a structural level, the organization of the complex investigation could have been more comfortable for the GM. Due to the lack of flow-charts or easy summaries, you’ll probably need to make copious notes, annotations, etc. – this requires serious prep work. That being said, if you can eliminate these glitches and work around them, you’ll have probably one of the most rewarding investigation scenarios out there. I can absolutely imagine this being classified as a masterpiece, and were it not for the shortcomings mentioned above, this would be a 5 stars + seal of approval book. However, all strikes against this adventure do accumulate and particularly the fact that the module, to a degree, cheats, is something that soured what I’d otherwise consider to be an inspiring adventure. As a reviewer, I need to review this for what it is, not for what you can modify it into. Thus, while I do consider this module to be very much worth picking up, while I consider it to be amazing in atmosphere, characters, etc., all worthy of the highest praise, I also have to take these seriously unpleasant aspects into account. Ultimately, they make it impossible for me to rate this higher than 3.5 stars. Whether to round up or down is a hard decision – my impulse, as a person, would be to round up, but when I tally up, neutrally, my gripes against the adventure, I ultimately can’t do that. You can get this massive investigation here on OBS!